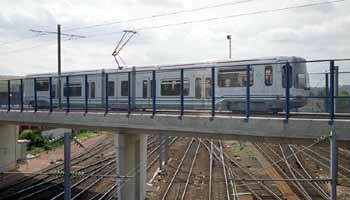 Light Rail Fits In sub-page; Road Junctions, Level Crossings And Traffic Signal Priority. Most images are "clickable" - run the mouse over them and if a "hand" appears then click & a larger version will open in a new window! This page primarily looks at some of the different types of signalling systems for where light rail and road traffic, pedestrians etc., interact. 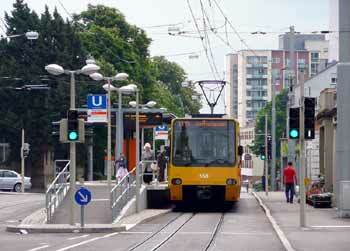 Stuttgart, Germany - to comply with German law and reduce the possibility of road traffic becoming confused and mistakenly following signals which are dedicated to the light rail, the system uses distinctive 'white' signals when operating within a street environment and more traditional railway style 'colour light' signals elsewhere. 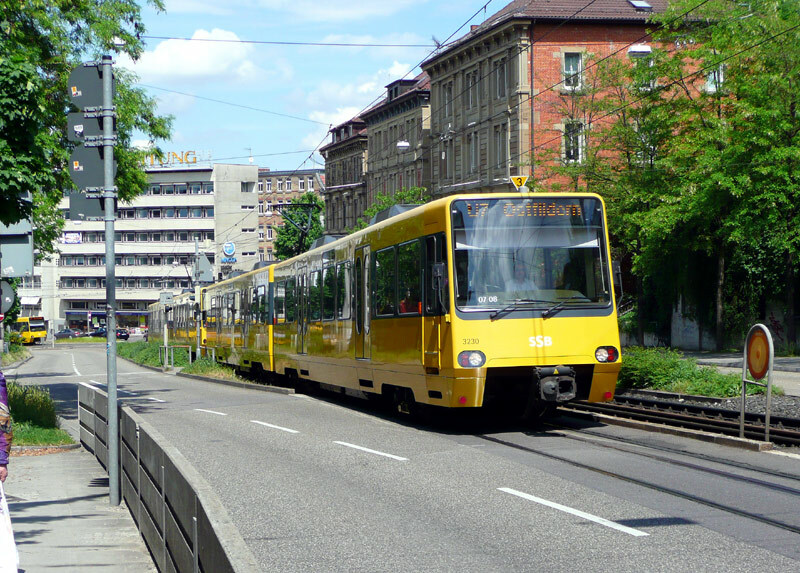 Many light rail systems also include locations where they use dedicated rights of way which are fully segregated from street traffic in traditional 'railway' mode. Whilst these segregated light rail lines can still operate using the 'on sight' system another option is for the line to be partially or even fully signalled. It all depends on local requirements. Generally though higher speed lines with poor sight lines will feature signalling, albeit perhaps only in the specific areas that need it. For reasons of safety it is usual for all tunnelled sections to be signalled. 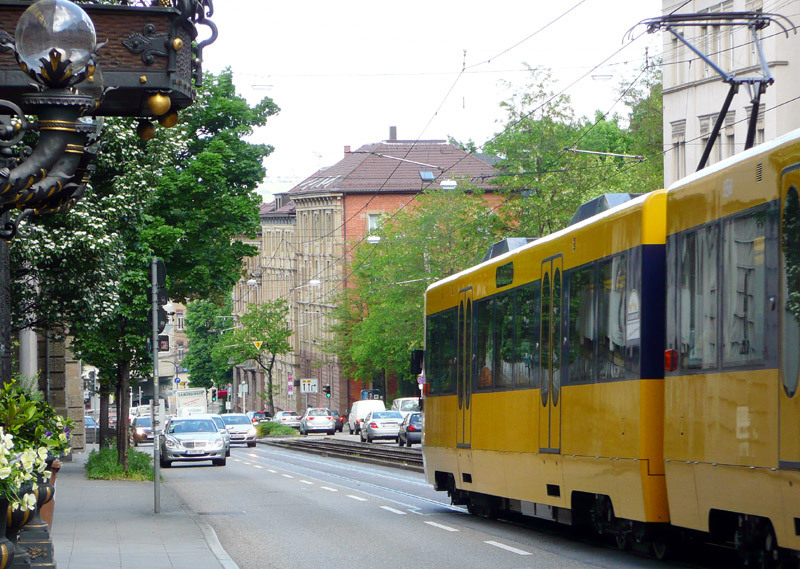 Whilst in the street environment light rail will typically operate in street tramway mode - which means being driven 'on sight' - just like all the other road traffic. However it usually benefits from facilities such as dedicated traffic signals which operate independently of & look different to the signals used by the general traffic. This gives the potential for priority - such as being allowed to make turns whilst other traffic is held at 'stop signals' or pull away from stop signals in advance of the other traffic - without confusing the other road users. 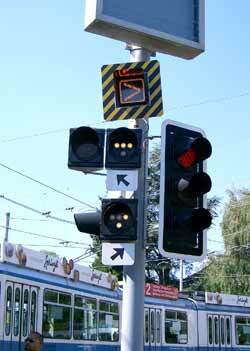 Sometimes where efficient detection systems are used so that the traffic signal control computers know where the LRV's are, it then becomes possible to create a 'green wave' whereby as the LRV approaches the various sets of traffic signals located along its route they automatically change in its favour. In this way the public transport may not even need to slow down. When fully effective this ability to influence the signals in its favour should reduce the time spent sitting at stop lights to an absolute minimum, considerably enhancing both the reliability and attractiveness of the passenger transport. white signals with each aspect being a different shape. This link is for a 69 second video clip named 'Tram-tsigs1-320.mpg' which shows Amsterdam, Melbourne and Düsseldorf. This link is for a 71 second video clip named 'Tram-tsigs2-320.mpg' which shows sequences from Basle, Toronto, (both as seen elsewhere on this page) and a British sequence from Manchester which does not directly relate to any specific still image seen on this page. 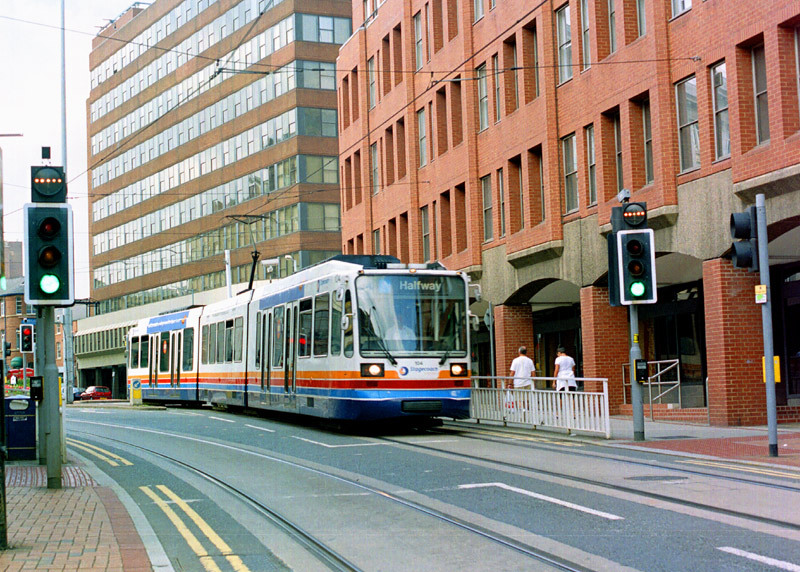 Whilst travelling along (or on reserved rights of way alongside) city streets so the light rail will often encounter and need to traverse junctions of various complexity. The demands of busy cities sometimes make 100% priority impractical,and therefore sometimes they will have to 'wait their turn' in the traffic signal phasing and / or travel through the junction at the same time as the general traffic travelling in the same direction. To minimise the delays it is usually possible to give the transport an advantage over the general traffic by programming the traffic signal computers to allowing then to go first. In the photograph seen below the signal head on the left is for services which turn left here, whilst the other signal head is for services which continue alongside the main road. 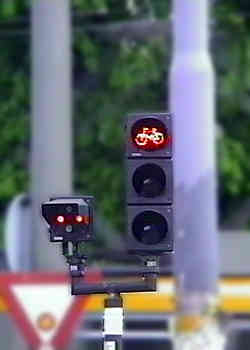 An acknowledgment light by the traffic signal computer indicating that it knows that the transport is there and wants to pass through the junction. This is in the form of an illuminated letter 'A' which comes from the German word 'Anforderung' and means 'request'. 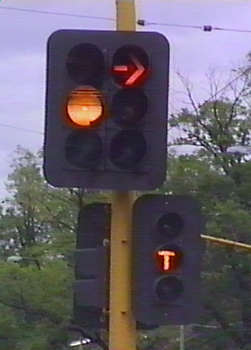 The 'stop' light - the equivalent of red traffic signals and comes in the form of a horizontal (crosswise - left-right) white bar. A 16 second countdown marker, to encourage the LRV driver to be ready to pull away as soon as told to do so (see below). The equivalent of amber traffic signals which comes in the form of a white dot. if travelling straight ahead the symbol is a vertical | (up down) white bar. if turning right the symbol is an angled white bar / (top right to bottom left). A light indicating which way the points (turnout/switch) is set. 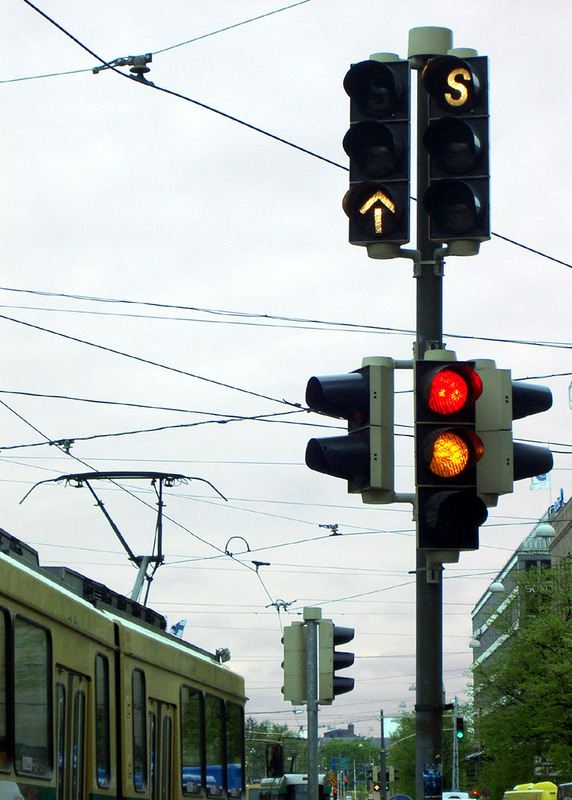 Dedicated light rail signals where two routes diverge and follow different roads at a busy road junction in Stuttgart, Germany. See text left for further information. 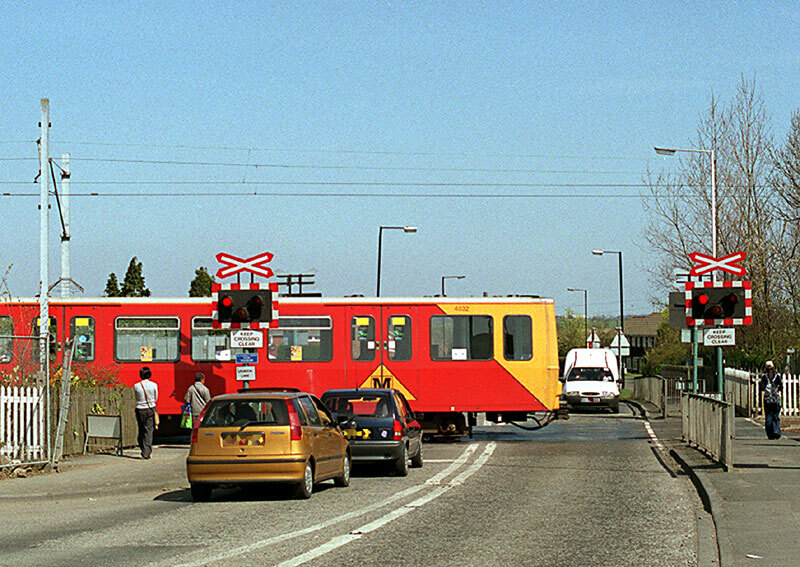 The significance of the countdown timer is that this location is also a passenger stop / station, and to make effective use of the limited time slot in the traffic signalling sequencing the traffic signal computer wants the LRV driver to have the passenger doors closed and be ready to depart immediately the equivalent of a green signal is offered. The signal heads are of course angled for clear visibility for the LRV driver - and not people standing on the footpath photographing them! Sometimes the opposite occurs and the roads encountered are relatively quiet. 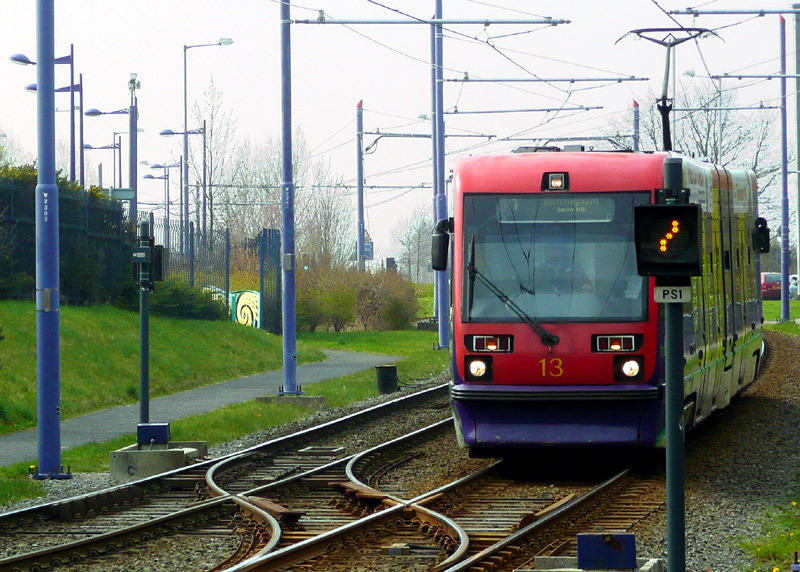 Especially where sight-lines are poor so safety is enhanced when electronic signal systems are used to advise other road users and pedestrians that the light rail vehicle is approaching. The solution adopted here and at other locations around the city is to use '2/3rds' traffic signals which only have amber and red (stop) lights. No need has been found for a green lamp - indeed, as this is also where several quiet residential roads meet its omission is advantageous as it saves the cost of fully signalling the entire junction. 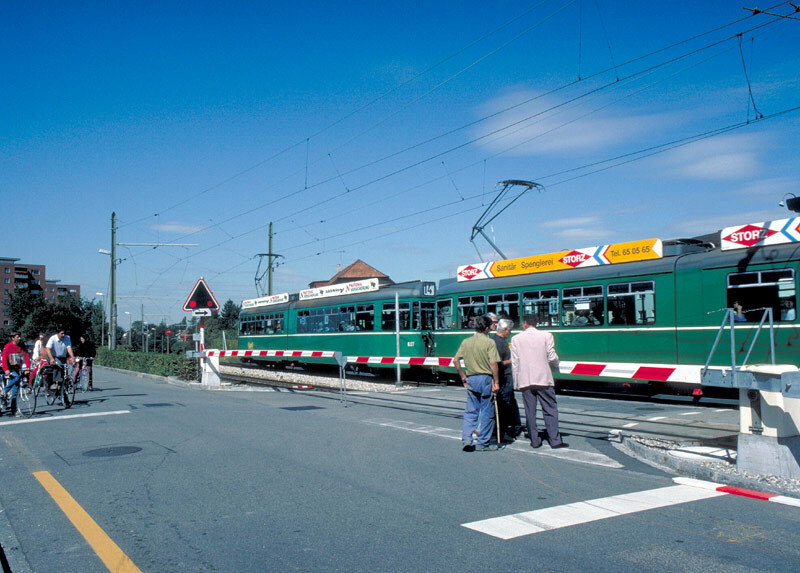 This example from Stuttgart shows a location where route 10 comes out of a private right of way which is away from the public highway, crosses the road and enters a roadside section of tramway. 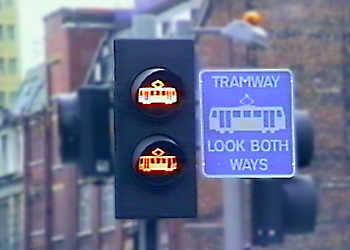 As the animated image shows (note the 10 second gap between animations), the lamps work as normal traffic signals, showing an amber lamp and then red lamp (with a steady light / not flashing) when the tram is here. This applies to all approach routes towards the location where the tram crosses the traffic flows, even (at other locations in Stuttgart) on roads where the traffic travels alongside the tram. The latter would be to prevent traffic from turning accross its path. Of course despite receiving the 'proceed' light it is still incumbent upon the tram driver to visually ensure that the junction is safe before traversing it. At a space restricted location in Stuttgart an alternative to restricting the traffic to just a single road lane sees the light rail sharing a traffic lane for a short distance with traffic signals being used to hold back the general traffic and allowing approaching LRV's to continue their journey with minimal, if any, delay. 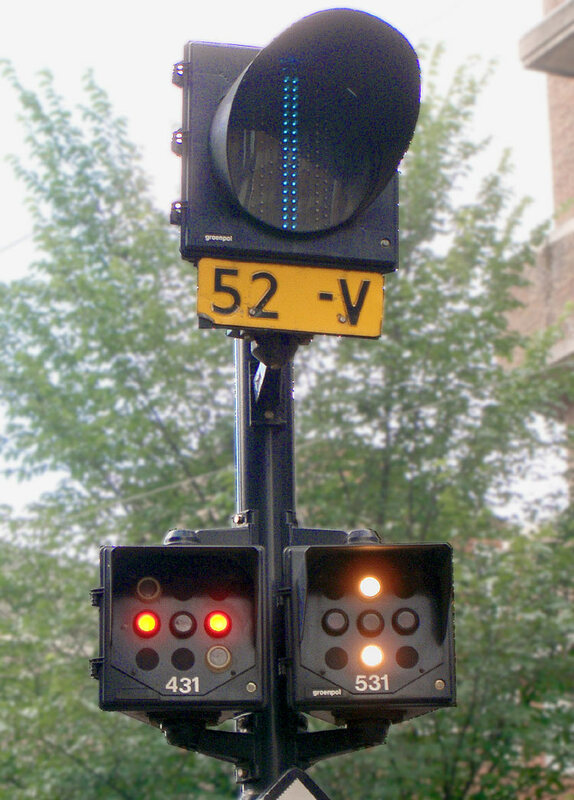 In the image on the left the illuminated letter 'A' is an acknowledgment light by the traffic signal computer indicating that it knows that the transport is there and wants to pass through the junction. The letter 'A' stands for the German word 'Anforderung' and means 'request'. The flashing 'amber' equivelent signal (rather than a 'go' aspect) advises the LRV driver that despite having the right of way it is still important to visually ensure that other road users have stopped and it is indeed safe to proceed. These views were taken in the off-peak period when road traffic was very light. Only one direction of travel needs to adopt this solution. 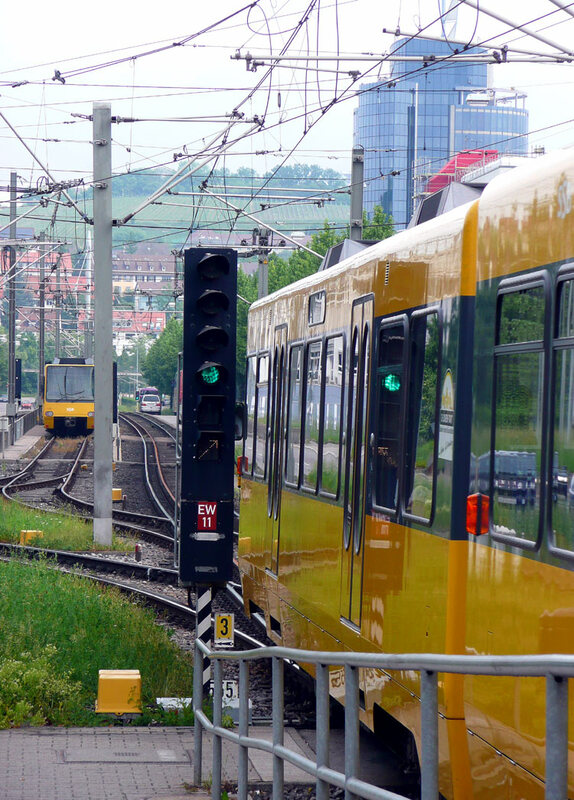 The three-rail trackage seen in these views is because whilst nowadays Stuttgart's system uses standard-gauge light rail vehicles it was originally a metre-gauge street tramway which over a period of years has been rebuilt and upgraded. 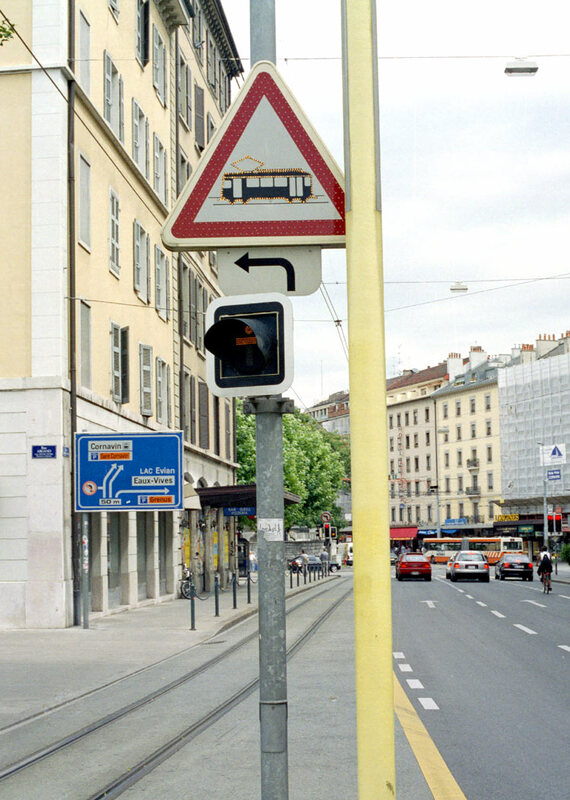 This example from Geneva, Switzerland shows a location where there is a side road accessed by traffic turning left across the path of the trams. As can be seen most clearly in the centre image, the red triangle and tram pictogram are marked out with red and amber coloured lights which flash alternately to warn road vehicle drivers to look out for trams. Because of the dynamic fluidity with which web pages adjust depending on the viewer's computer's screen size these images may be aligned slightly differently than the others on this page. Two sets of 'normal' signals side by side with a special road sign (Transit Signals) alongside them. red / yellow / green lenses which show the word 'bus'. 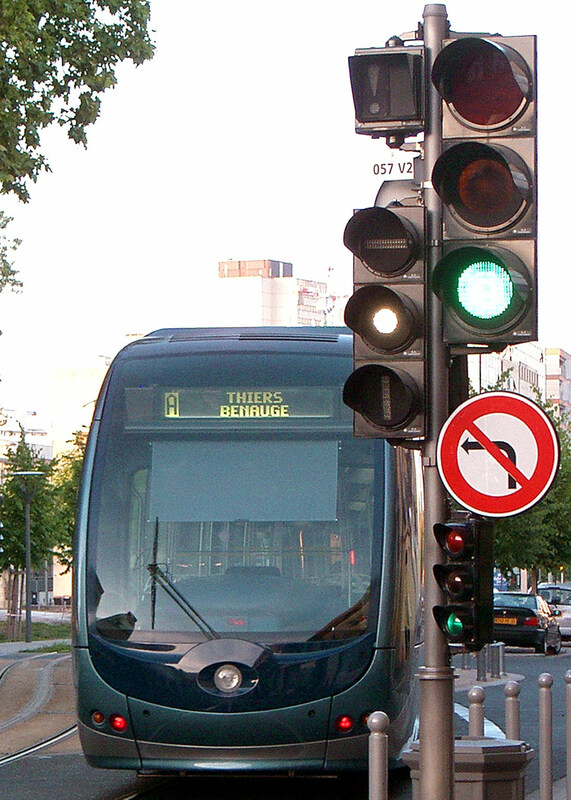 Signalling solutions often vary where buses and light rail use the same road, with alternatives to the Strasbourg example seen above including them both following the same visually distinctive signals, just the trams following distinctive signals (ie: the buses follow 'normal' traffic signals) and them both following 'normal' traffic signals. 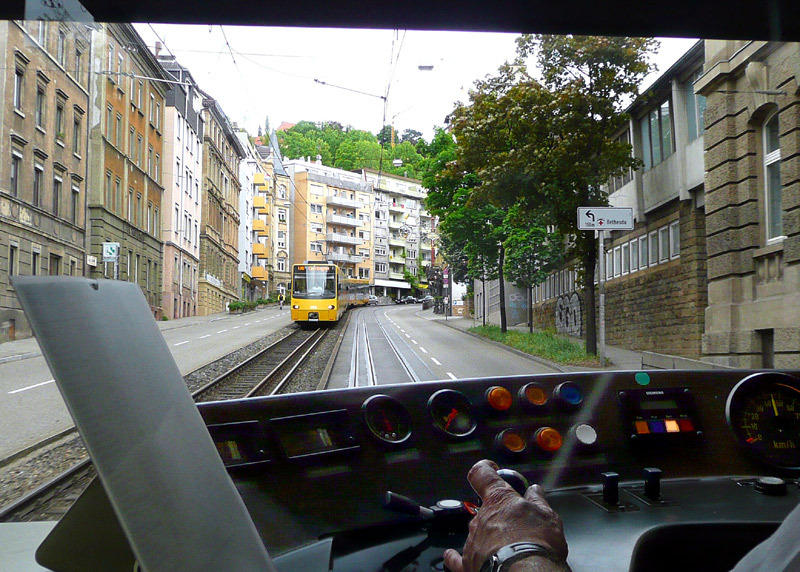 The latter option is only possible in places where legislation does not require trams to be provided with dedicated signals. Sometimes road junctions are also where several light rail routes meet and therefore there are also conflicting movements between the different services. At these locations absolute priority is very unlikely to be possible. 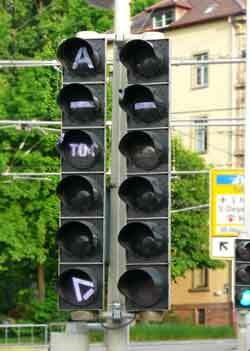 Traffic signals at a three-way junction. In this image the signal for turning left is changing to 'go', when it changes back the coloured signals for the road traffic will then change to green. 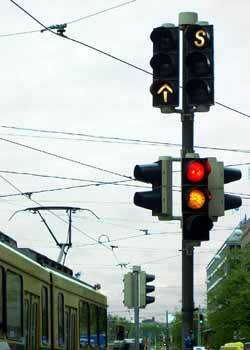 Where routes diverge there are separate signal heads for trams travelling in different directions. Note the white letter 'S' for stop and white arrow for go. The intermediate symbol is a white bar. 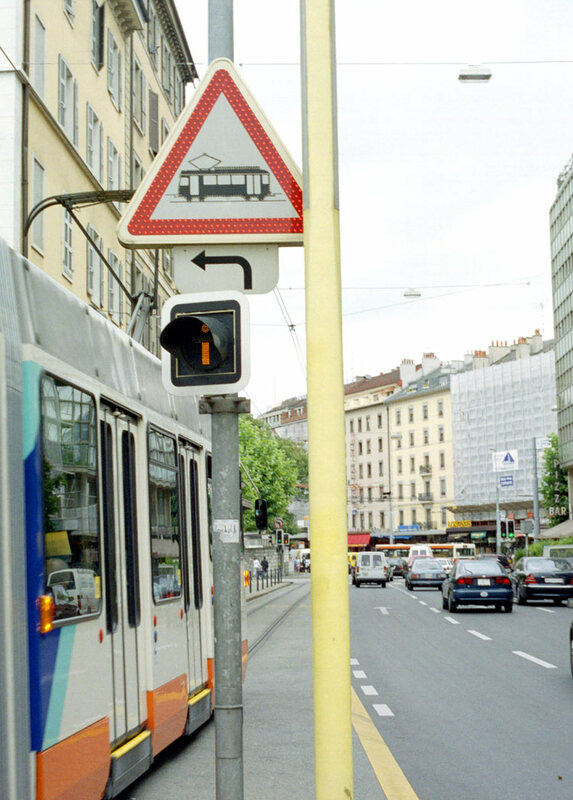 Zürich, Switzerland: Where routes diverge there are separate 'white dot' signals for each direction, plus another indication (the orange chevron) advising tram drivers which way the points are set. 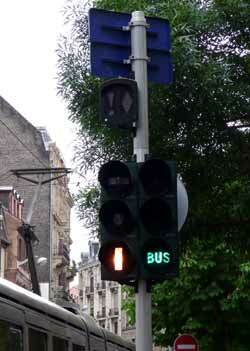 Amsterdam, Holland: Where routes diverge there are separate 'white (or red) dot' signals for each direction, plus a different type of indication advising tram drivers which way the points are set. 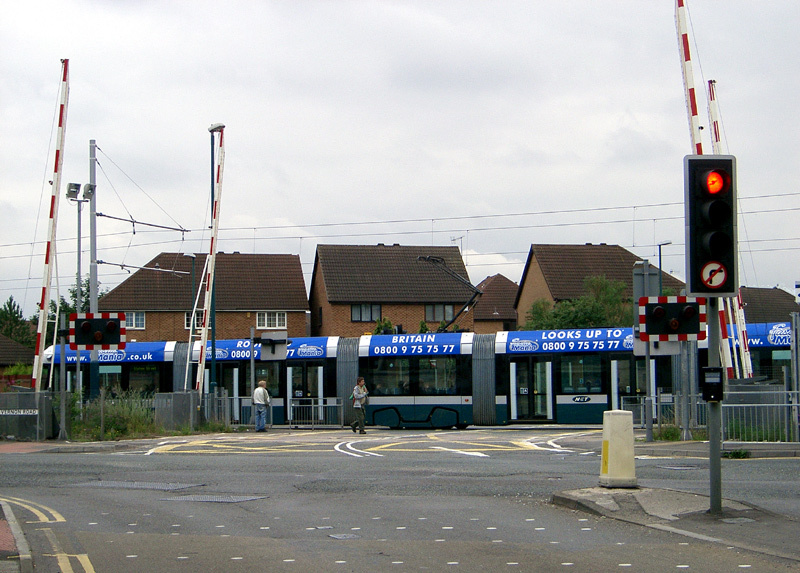 Although British tramway traffic signals are broadly similar in theme nationwide a few local differences occur with the signals which indicate the route the track has been set at junctions. 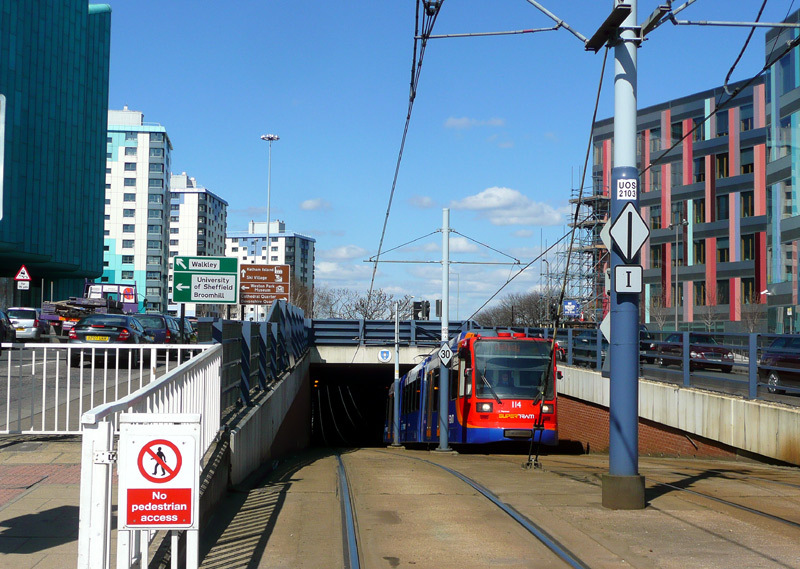 These images show examples from the Midland Metro - with large dot orange lights (left) and Sheffield Supertram - with small dot white lights (right). 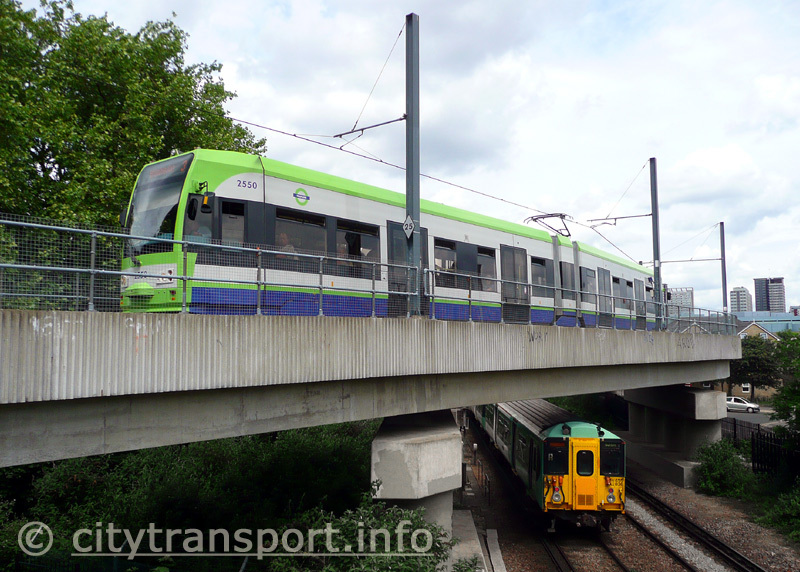 Variations in signal operation at different types of junctions on the Croydon Tramlink system. 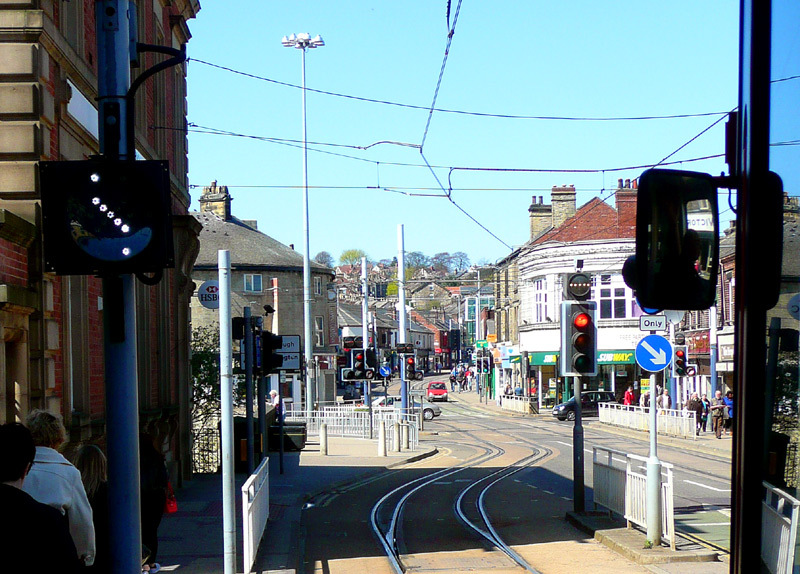 This example comes from a busy road junction where there also are traffic signals (not seen in this image) and the tram signals operate in a way designed to minimise delays / maximise junction throughput. As the animation shows, normally only 4 lamps illuminate for the 'stop' function. The central lamp is used to advise the tram driver that the traffic signal control unit has noted the presence of the tram and has (or is about to) initiate a sequence for it. 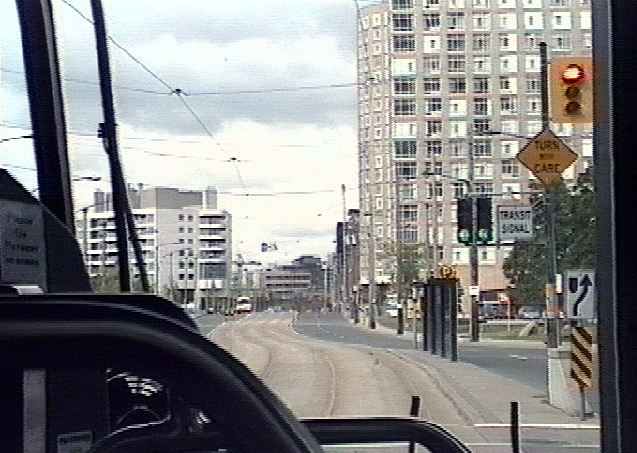 The animation correctly reflects that two trams bear right for every tram travelling 'ahead'. 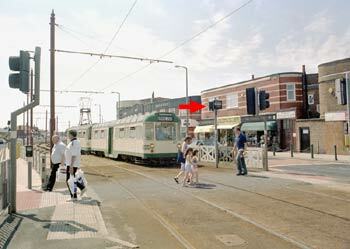 The location is very close to the Church Street tramstop. This example is on a section of converted former mainline railway, and although the route predominately operates on the principle of 'line of sight' the junction is signalled. Typically trams alternate between those which turn left or continue ahead, which is reflected in the animation. Note how the upper signal only shows 'stop' / 'go', with 'stop' being the normal aspect except for when a tram is approaching. The animation is of course 'speeded-up' - what are seen here as 10 second periods of apparent inactivity represents 5 - 10 minutes. The location is Arena tramstop. By 2009 the Blackpool - Fleetwood interurban line had been partially retrofitted with modern signals, although at this junction the traffic signal planners managed to 'get it wrong' and use the signals to delay tram services. See text (below) for detailed information. 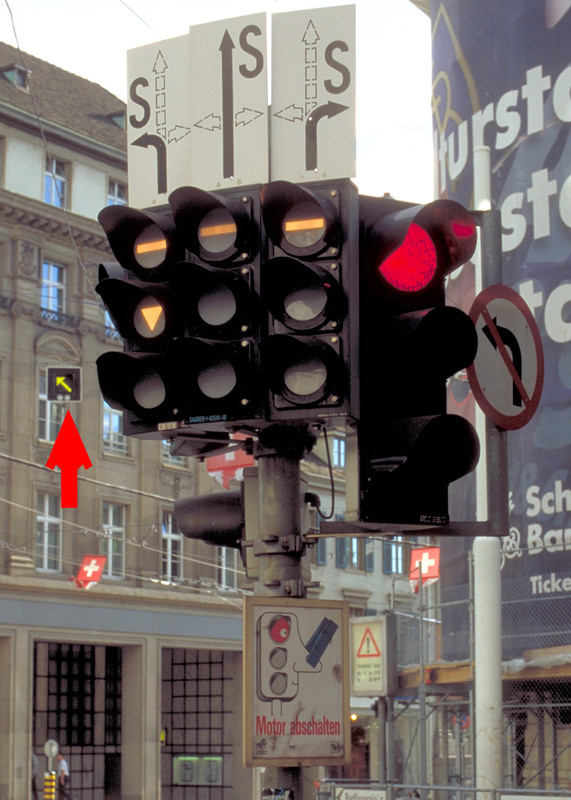 Because of the small size of the signals in relation to an image which needs to show an overview of the location the signals are more clearly seen in the clickable larger image. 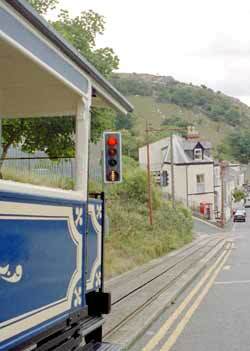 The (lower) Great Orme Tramway line in Llandudno, Wales has also been retrofitted with the specialist British tram signals. 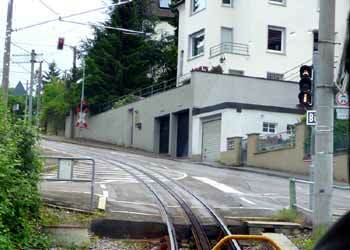 The signal seen here is showing 'go' and as the descending tramcar must cut across the path of the road traffic all the other signals are at red (stop). Note how the signal is an intergral component of the signal head. Clicking this Great Orme Tramway image will lead to a dedicated page showing larger and more images in a popup window; alternatively clicking here will open the page in a new full-size window. 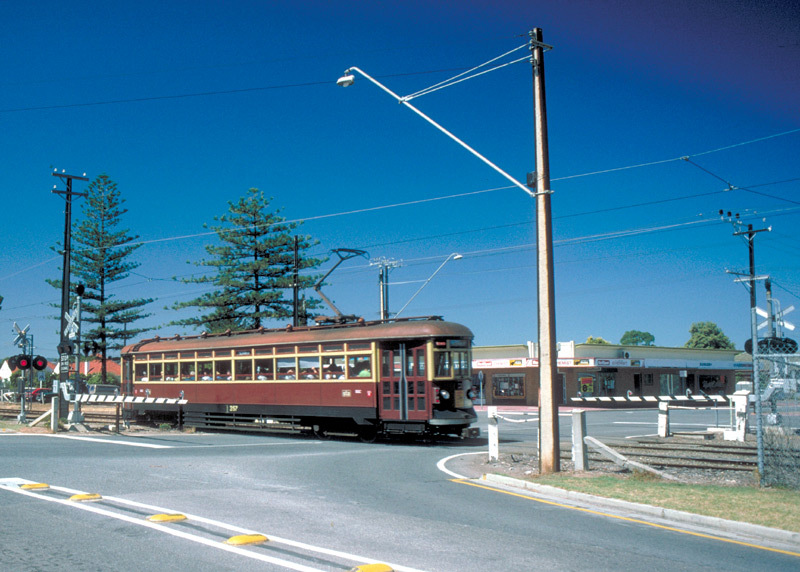 The picture shown above left from the Blackpool - Fleetwood interurban line was taken at a road junction where the introduction of the new signals has negatively impacted upon traffic flow. Previously the trams would follow the traffic signals used by the general traffic, but instead of continuing with this (perhaps with the trams given a few seconds head start) the traffic signal engineers created an appalling scenario whereby the trams must now wait their 'turn' in the lights' sequence, which here is AFTER! the road traffic. (Apparently they don't have signal pre-emption?) 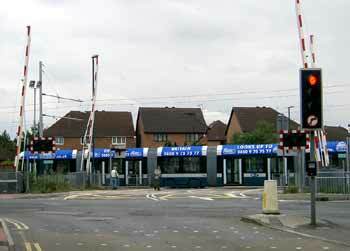 The net result is that the traffic signals take considerably longer to sequence through the various phases - especially as they now also include a separate 'right turn' phase (for vehicles wishing to cross the path of the trams - this in itself being quite reasonable) and therefore journey times are extended, disbenefiting tram passengers and other road users alike. Aren't our road planners wonderful? - maybe they mean well but in their actions they are mis-managing traffic, reducing junction capacities and generally making life less pleasant for everyone. 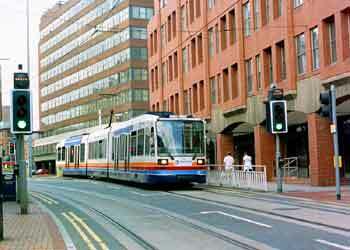 Another specific aspect of (British) tramway operations at traffic signals where the rules have been designed to disbenefit trams and other road users alike comes from a document called Guidance on Tramways - Railway Safety Publication 2 which has been issued by the Office Of Rail Regulation. Ruling 233 states "Two or more trams should not normally operate through a signalled highway junction consecutively, in the same direction, and within the same phase. Any proposal to do so should be discussed with the Inspectorate at an early stage." This document is in Adobe Acrobat format and can be found at http://www.rail-reg.gov.uk/upload/pdf/rspg-2g-trmwys.pdf . The implication of this ruling is that if two (or more) trams were to bunch - perhaps because they originated from different locations - the second (and subsequent) tram(s) would have to await a completely new phase of the traffic signals at each junction - not only delaying itself but all the other road traffic too. Whilst this ruling *could* be perfectly sensible on a segregated and fully signalled section of light rail (ie: when operating in railway mode), as far operating on the public highway in 'street tramway' mode is concerned this is sheer madness and simply must either result from desk-bound pen-pushing officials who are so wrapped in their own compartmentalised worlds that they have completely lost the plot as to how road traffic flows or it presages similar time-wasting congestion-causing rules which will prohibit (two or more) buses and heavy lorries from passing through traffic signals in the same direction during a single traffic signalling phase. Where segregated light rail lines operating in traditional 'railway' mode cross the roadway either traffic signals or traditional railway level crossing type flashing lights can protect the intersection. On higher speed lines or where visibility is restricted lifting barriers are an added safety option. Basle, Switzerland: A level crossing on a high-speed suburban tramline guarded with full barriers and flashing lights. Adelaide, Australia: A level crossing on this high-speed inter-urban tramline guarded with half - barriers and flashing lights. This line was originally a steam railway, it was converted to trams in 1929. Whilst it is normal for level crossings to feature red coloured lights that flash when the train (or tram) is approaching, in Belgium level crossings also feature white lights which flash at times when nothing is approaching. This gives road vehicle drivers confidence that the lights are working correctly. 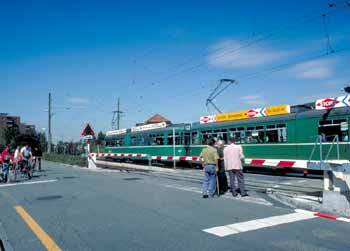 In addition to the traditional boom barriers over the roadway this level crossing on the Belgian coastal tramline also features barriers over the pedestrian footpath. Also note the flashing word 'tram' which is a distinctive local feature. Because of the small size of the images on this page the animations in this image are best seen in the clickable larger version. 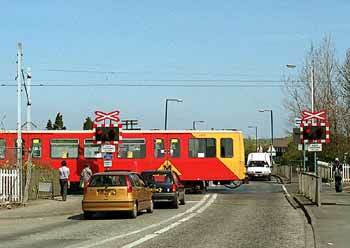 Tyne & Wear Metro, England: Level crossing protected by railway-style flashing lamps but no barriers. 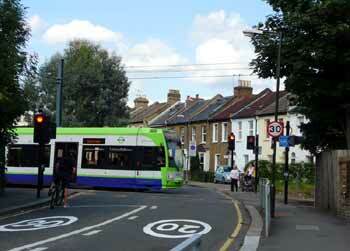 London (Croydon) Tramlink, England: Level crossing protected by traffic signals but no barriers. This crossing at David Lane on the Nottingham NET system must be unique because whilst the light rail is protected by the traffic signals as part of the pre-existing road junction the parallel heavy rail trains are protected by traditional railway flashing lights and lifting barriers. At locations where surface crossings would be inappropriate flyovers or flyunders will allow light rail services	to pass unhindered in safety. 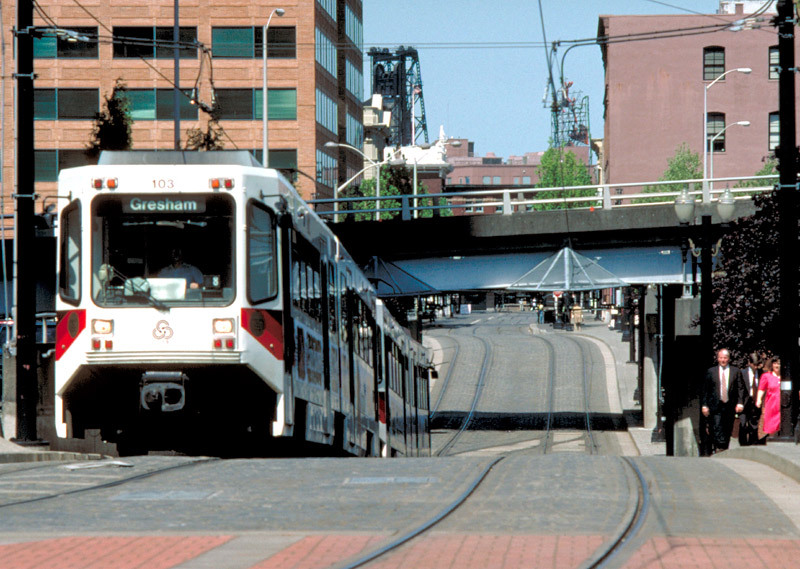 This can apply whether the light rail is operating in 'street' or 'off-street' mode. Under a busy road junction. 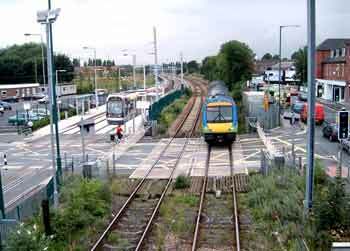 For pedestrians frequent crossing points permit easy access across a segregated section of track which is fenced off to inhibit pedestrian access, perhaps with wig-wag flashing lights and audible alarms advising them that a vehicle is coming. For added safety a linked signal can give the LRV driver confidence that these lights are working correctly. 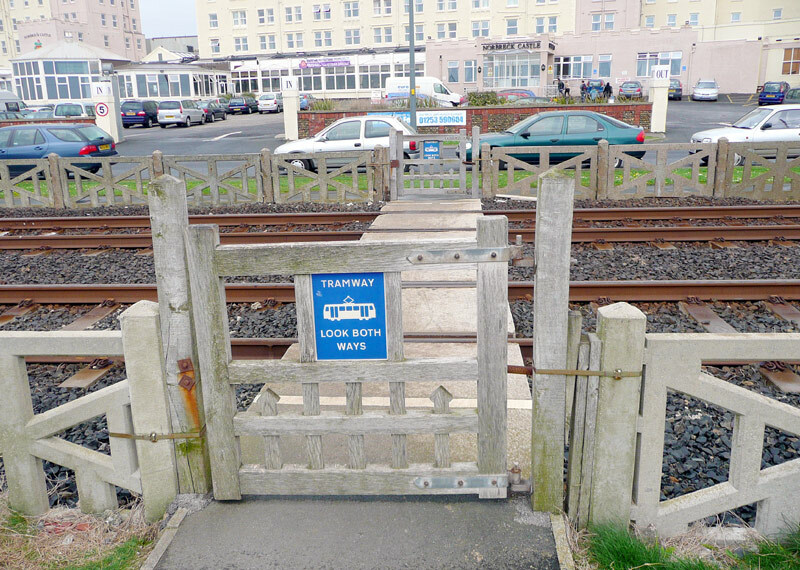 Blackpool, England: One of the numerous pedestrian crossing points over a segregated section of line protected by pedestrian operated swing gates. Pedestrians wishing to cross the line must use their eyes - in the same way as they should look before crossing a roadway. However as visibility on the straight section of track is very good, and trams only travel at modest speeds, so maybe this is sufficient to ensure safety. 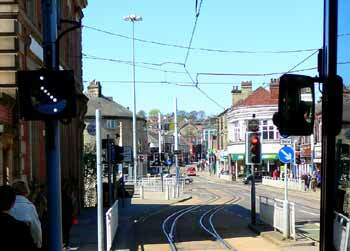 Sheffield, England: Signals at a pedestrian-controlled road crossing on a section of street tramway. These only show the 'go' aspect when trams are actually approaching. 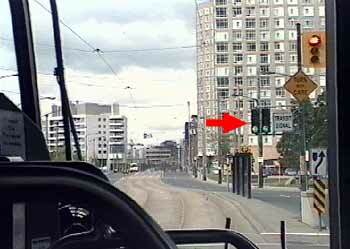 Note how the tram signals are a separate fitment from the signal heads for the road traffic. Manchester, England: Flashing 'wig-wag' lights and a fixed sign at an otherwise unsignalled pedestrian crossing. The lights flash alternatively, but in this video-still they have been 'caught' at the halfway stage. 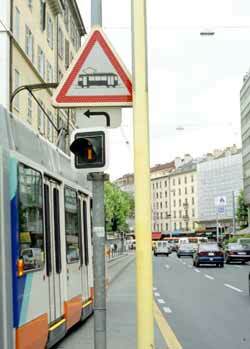 Stuttgart, Germany: Flashing 'wig-wag' lights and a fixed sign at an otherwise unsignalled pedestrian crossing. 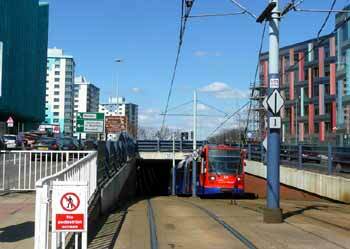 As with Manchester, the lights only activate when a tram is approaching. 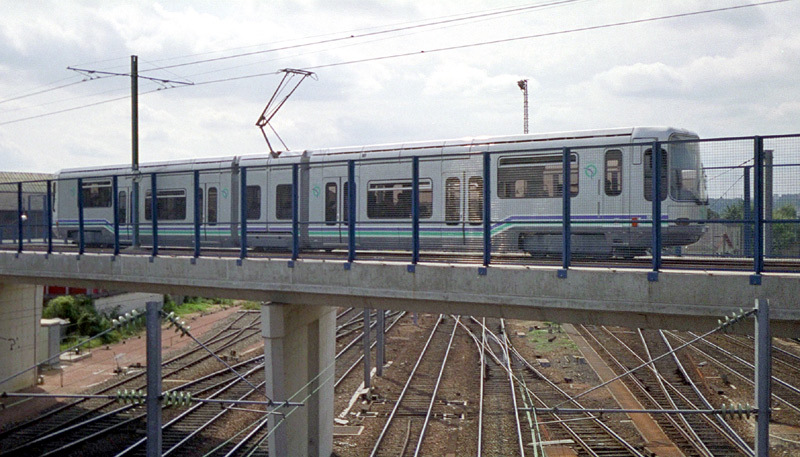 In both cities seen above and below the lights normally only activate on the approach of the transport; at other times they remain off. A pedestrian crossing point across a line located on a dual-carriageway median in Düsseldorf, Germany. For safety this crossing is fitted with wig-wag flashing lamps which advise passengers when a vehicle is coming (left) and a linked signal (a flashing white light) to give LRV drivers confidence that the pedestrian signals are working correctly (right). Direct links to other Light Rail Fits In pages. 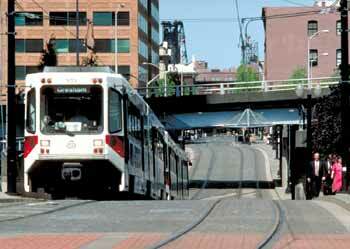 Light Rail And Compatibility With Parked Vehicles. Lawn Track - Creating Green Corridors. Light Rail, Pedestrian Zones And Transit Malls. Return to Main Light Rail Fits In page.